VPSCheap.net Review 2019: Is VPSCheap.net a Good Hosting? Las Vegas-based VPSCheap.net only offers VPS hosting solutions with a good range of features at cheap prices.However, their long years of experience doesn’t make up for a slightly dodgy performance. VPSCheap.net was first introduced to the hosting market in mid 2010 with the aim to provide high-quality VPS hosting solutions with excellent uptime for Linux and Windows at low cost. VPSCheap.net is located in Las Vegas, U.S.A and has data centers in Chicago, Atlanta, and Dallas. The website is full of information and available in English. All VPSCheap.net servers are built on Intel Xeon machines with dedicated ECC Ram and fast RAID storage to deliver optimum performance. However, VPSCheap.net doesn’t seem to live up to its promise due to frequent downtime and unstable servers leading to many unhappy customers. A cPanel comes with a software auto-installer. However, cPanel licenses are an addon you can purchase at checkout. The cPanel also comes with a File Manager and backup features for managing and backing up websites. VPSCheap.net uses industry standard WHMCS and doesn’t offer CDN. 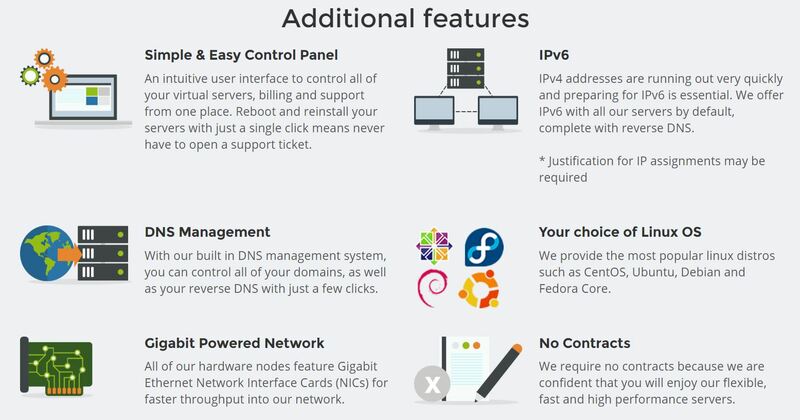 All VPSCheap.net packages also include a built-in DNS management tool giving you full control of your domains and reverse DNS without a hassle. You will also have full root access that allows you to install and run any app on the server such as WordPress, mail exchange, phpBB, Joomla, Magento, and tons more. Without doubt, VPSCheap.net’s strongest point is its pricing. It offers a total of fifteen different VPS hosting packages divided according to the type of server you prefer: SSD servers, NVMe servers, and HDD servers and categorized into Basic, Business, Premium, Advanced, and Enterprise. They all vary in storage, RAM, CPU, and IP addresses (both IPv4 and IPv6). All Basic packages are only available in annual subscription, while the rest of the packages are available in, as short as, monthly contracts. VPSCheap.net accept credit card, PayPal, and Bitcoin and offer a 30-day money-back guarantee for new comers. VPSCheap.net provides different support channels: live chat, ticket support, and a toll-free phone number. Unfortunately, the live chat support is available for existing customers only. However, you can still drop them a line by submitting a ticket. They’re very responsive and knowledgeable. You can also find some tutorials, a blog, and a very good F.A.Q section. onClick="trackClickout('event', 'clickout', 'Vendor Page - Visit User Reviews', 'VPSCheap.net', this, true);"
Yeah, avoid this company. They don't compensate for multiple outages. They lie about outage reasons. They never find a problem with their systems even when you send in screenshots of down VMs. They will steal your money if you try to cancel and ask for a refund of the outstanding balanace. Terrible performance and customer service. Nothing, I couldn't even install VestaCP via putty as my server resources ran out before it could fully install. That's terrible performance. Then I asked for a refund, and was charged twice as the invoice was showing "unpaid". Only one payment was apparently covered under the 30-day money back guarantee, and they proceeded to keep my money. So as well as a waste of time, it was a waste of money. Any reputable company is going to refund a duplicate payment. I cancelled the service within a couple of hours due to the performance.AVOID AT ALL COSTS. For a hosting provider run by a team with over thirty years experience, I honestly expected more from VPSCheap.net. However, it isn’t guaranteed that your website will be running uninterruptedly without any dropouts. The pricing is definitely cheap and there are several features to appreciate from this provider. Wondering how VPSCheap.net stacks up against other Web Hosting companies? Enter any other Web Hosting company and we will give you a side-by-side comparison.